That is from John B. Taylor, of the Taylor Rule fame. Would anyone like to argue that this will turn out well? Proponents of things like NGDP level targeting (i.e. Market Monetarism) believe that, in order to enable an economic recovery, the Federal Reserve must credibly increase consumers' inflation expectations. They like to think that the failings of the Fed have been that their policies have not created sufficient expectations about inflation. That is, despite injecting the economy with piles and piles of new money, most people still believe that the "Quantitative Easing" is all very temporary. In their minds, economic actors are merely waiting for the inevitable Fed exit plan to unfold, which will presumably collapse inflation back to "reasonable" levels. To put it succinctly, the Market Monetarist view is that inflation expectations aren't credible in the long run. We see inflation today, but we don't expect it to keep rising at the same level. Rather than argue against this point of view, let us take a moment to fully entertain the implications. If all the Quantitative Easing out there has been insufficient to affect long-run inflation expectations, then some Market Monetarists suggest that the Fed must print as much money as is required to make those expectations go up. Let's suppose I say I'm going to give you a dollar at the end of the day. You might buy a coffee on your lunch break or something (half a coffee these days, thanks to inflation). So then I say I'm going to give you five dollars at the end of the day. You say to heck with it and treat yourself to a Big Mac at lunch. So then I say I'm going to give you $20 at the end of the day. At this point, some of you are going to say, "Alright!" and go to the fancy sushi restaurant across the street for lunch. But, many of you will only start to get suspicious. "Twenty bucks? What's the catch?" Next, I swear up and down that I'm going to give you $500 at the end of the day. We all understand the value of $500, and we all understand that it just doesn't work this way. Nobody just says, "Okay, everybody, I'm going to give you $500 tonight!" There's more to it than that. By the time I reach the point where I am promising to give everybody $20,000 at the end of the day, most reasonable people understand that it is not going to happen - even if I have already passed out a fresh $10 bill to each of you. Now go back to the top of the page and look at the graph. 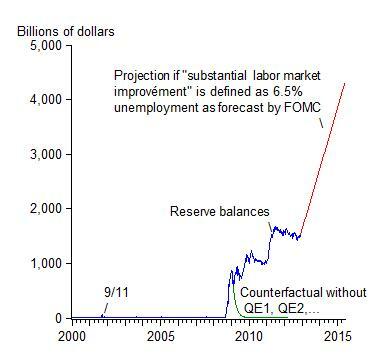 The amount of money the Fed is suggesting that it will inject into the economy is comparable to if I show up at your office this morning, promising to give everyone "a million-kajillion-gazillion-pavillion-cotillion dollars" at the end of the day. In short, it's a promise so big that I no one in their right mind would ever take it seriously. So if this latest round of Federal Reserve stimulus doesn't work, I would like the Market Monetarists to understand that there is a limit to how far the Fed can push market expectations. The Fed can always print more money, but eventually people reach a point where they start to reason more like how John Taylor is reasoning. They start to think that, if such a policy is implemented, it is too risky to be brought to fruition. That, or else they start to say, "I see where you're going with this and you are either not serious about creating that much inflation, or you are patently insane and hell-bent on destroying the modern currency system." Rational Expectations is a very real phenomenon, in my opinion, and a powerful one. But economists need to remember that they are Rational Expectations, not merely Data-Driven Expectations.